Climax pioneered the use of a single, large-diameter bushing in trailer air suspension with our patented TRI-FUNCTIONAL bushing. Used in union with rigid beams and solid axle connections, TRI-FUNCTIONAL bushing deliver enhanced road stability and ride quality on-highway or off-road. The result is a dependable suspension system that offers extended life, reduced maintenance and maximum protection for cargo, drivers and equipment. 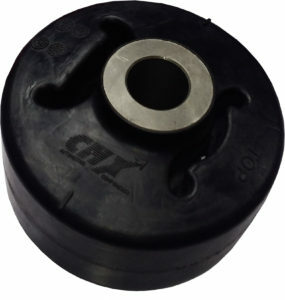 The void design and material composition of these unique bushings are critical to controlling the horizontal, vertical and roll forces a trailer generates rolling down the road. A key element of the pivot connection, the TRI-FUNCTIONAL bushing is contained inside the beam with sufficient compression to permit it to flex but not rotate. Compression of one bushing combined with expansion of the opposing bushing helps keep wheels on the road during turns and over irregular surfaces. • Enhanced cargo protection and ride. • Broader range of applications. • Maintain proper axle alignment and suspension tracking. • Stands up against tough operating conditions. • Voids expand and compress to absorb road induced forces allowing optimum suspension articulation without over stressing the axle. • Ride quality and payload protection surpass other bushing designs. • Voids allow increased articulation to provide exceptional control during turning and roll events. • The especial void shapes enhance the axle’s ability to act as a torsion bar, resisting trailer roll forces.